We hit the road an hour later than planned, but what's the rush? 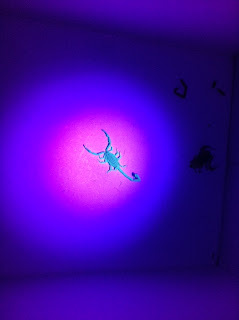 Yesterdays highlights included guns and scorpions. Aunt Debbie gave Daniel an early birthday gift unlike any present he has ever received. His first real gun. And this is not just "some gun" but a Colt 32 police six-shooter that belonged to Teckie's grandfather. 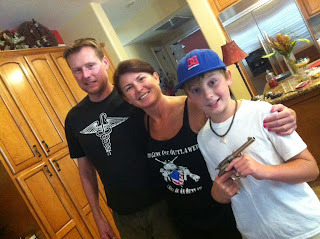 This ninety-year-old family heirloom was Daniel's great grandpas working pistol when he was a prison guard. This thoughtful gift catapulted my almost thirteen-year old to Cloud Nine. Our travel companion....Freakishly amazing, huh? As for our pet scorpion that's traveling in a jar with us? He or she is scary gross. Lucas, Jenny and Daniel were playing cards in the living room last night when they saw a silhouette of a scorpion in the fan light. Grabbing a ladder to reach, the ugly thing was captured and eventually Debbie put him in a jar so we would have a unique souvenir. Of course, we shined a light on the little critter to see him light up like a poisonous glow-stick. I have never seen a live scorpion, none of us had. We can check that off the bucket list? ﻿﻿We pulled into our hotel after a solid four-hour drive that included lightening. Quickly, we unpacked and headed out to buy a National Park Year Pass. We were captivated by the loud thunder and lighting that surrounded us. And then? It poured. Yes, heavy rain ... and we didn't have a slicker, umbrella or jacket to be found. The angry storm passed in time for us to soak up the scenes and not get too wet. Admittedly, it was exciting and definitely out of our usual routine. It is so much easier going DOWN into the Grand Canyon. While in that ginormous dirt hole, we hiked down The Bright Angel Trail and went quite far then realized we weren't prepared to hike in the rain, without a map or inhaler. We huffed back up, Daniel with his camelback on, was fully prepared for this experience. After that, we hopped on the red shuttle that carried us to ten scenic points along the canyon . We ended at Hermits Rest for ice cream, then headed back to catch the next shuttle to The Village. Everyone around us was European, or Asian or Not-American. This place is an International melting pot. Our inner explorers were starting to fade. Morale was up, but physically we were pooped out, and needing for some R and R. So, after we cleaned up, we headed to dinner and the bowling alley. And arcade. There's much to do here, but not enough time. This trip is awesome. My kids are not perfect, but I can say, that I enjoy who they are and who WE are when together. Both are kind, light-hearted, dedicated to the adventure, and have stolen my heart. But mostly, they are so appreciative of all we are doing and that feels wonderful. These two are not bratty or complaining ... just grateful for this time together. P.S. Thanks Again to Debbie and Matt for hosting us in Gilbert.